Anyway, Bubbles analyzed my prior reviews and determined that I would most enjoy a saucy new york style pizza from a little place in West Scranton called Roberto's. I had never heard of Roberto's, but Bubbles said he grew up on the stuff and swears by it. When we arrived, we parked in front of the small strip-mall style restaurant and walked into the simple, yet clean and comfortable dining area. Our waitress promptly greeted us, and we ordered a large cheese pie. As we were waiting, the resident pizza expert explained that Roberto's has been in business for a long time, at least 20 years. It didn't take long, and the waitress was back delivering a pizza that I just knew I was going to like as soon as she set it down on our table. You could see the sauce peeking through around the edge as well as through little holes in the cheese. Now that's what I'm talking about! 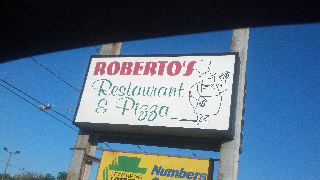 Bubbles was right, Roberto's does serve up quite a saucy pie and I was psyched about it. I took a bite and immediately verified that Bubbles in fact does know his stuff. It was one giant slice of saucy goodness. The sauce was slightly sweet, just a tad sweeter than I like, so I added a little garlic and black pepper and we arrived at sheer perfection. If you like a cheesy pizza, you may want to consider extra cheese, because although they do provide a pretty good amount of cheese, the high sauce content makes the cheese take a back seat. I'm OK with that, but I know a lot of people are into a cheesy pie, so some food for thought. The quality of the cheese is fantastic, and it melts into a greasy delicious treat. I found the crust to be a little different from the past few NY style crusts I've had which were very thin and baked directly on the brick oven. This crust was considerably thicker, kind of like a pita bread, and was cooked on a screen. Cooking on the screen allows the thicker dough to cook through thoroughly and evenly, which created a crispy bottom, and a beautiful bread-like consistency in the middle. 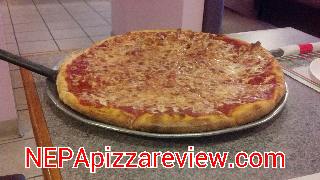 I was impressed with the quality of the crust, and it was evident that the man who was making the pizza, who my associate identified as the owner, has making pizza for years and really knows what he's doing. So we'll call the pizza maker Roberto, and say thank you for a well made pie! Also, thanks to Bubbles for recommending such a great pizzeria. THE BOTTOM LINE: This no-nonsense, simple pizzeria is a great place to get a fine pizza either to dine in with or to take on the road. 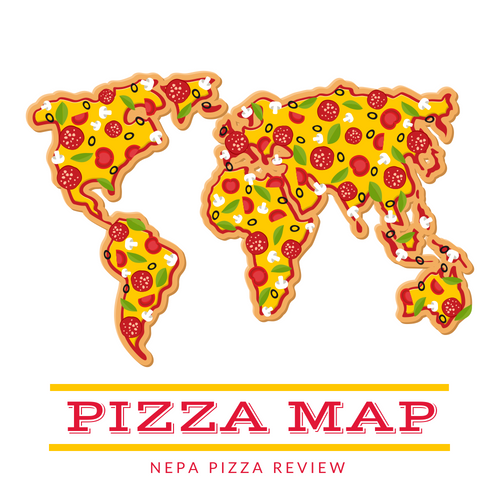 If you like a saucy pizza, this is the place for you. If you are not so into sauce, I'd consider customizing with light sauce and extra cheese, because the ingredients are very good and will make a great pie no matter how much of each ingredient are on top! In addition, this large pizza is a fantastic value at $9.95. It's a nice combination whatever it is! It's a saucy pie and the ingredients are just right.